Figure 2620 shows the ZLPs (zero-loss peaks) of a CFEG (cold field emission gun)  at various emission currents as well as the monochromatized ZLP  in logarithmic vertical scale. The inset lists the extraction voltages V1, probe currents Ip and the FWHMs (full width at half maximum) of the ZLPs. Note that the FWHMs quantify the energy spread. In general, the lower extraction voltage and probe current gives smaller FWHMs of the ZLPs, meaning that the higher energy resolution can be obtained, while the one with a monochromator still has the lowest FWHM. The F-N energy distribution of emitted electrons includes two distinct regions : a low energy Fermi tail and a high energy tunnelling tail. In other words, Equation 2620a indicates that the energy distribution of emitted electrons is the product of the Fermi–Dirac distribution function ln(1+eΔ/kT) and the tunneling probability exp[-b(φ+Δ)3/2/F], which produce the Fermi tail and the tunneling tail, respectively, and causes beam energy-broadening in field emission guns. The low energy Fermi tail is a property of the Fermi surface of the tip material (e.g. tungesten) and is independent of the extraction voltage. 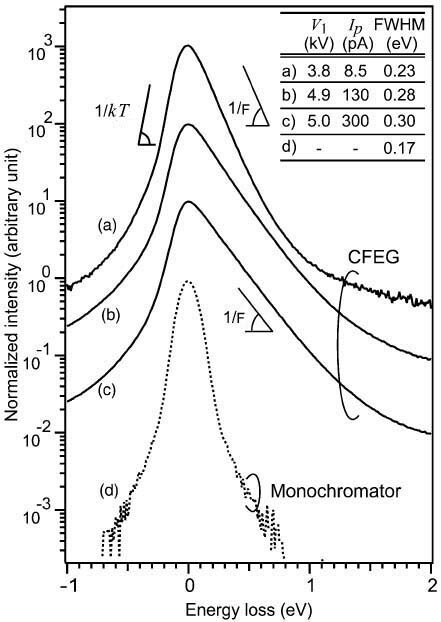 The left side of the CFEG’s ZLP is comparable to that of the monochromator. The slope of the high energy tunnelling tail is determined by the field strength. In this case, it is difficult to determine the onset of the inelastic scattering within a low-loss spectrum because the tunneling tail induces a strong background. Therefore, the monochromator has an advantage in the measurement of small bandgaps (e.g. ≤1 eV). Kothleitner, G., Hofer, F., 2003. EELS performance measurements on a new high energy resolution imaging filter. Micron 34, 211–218.